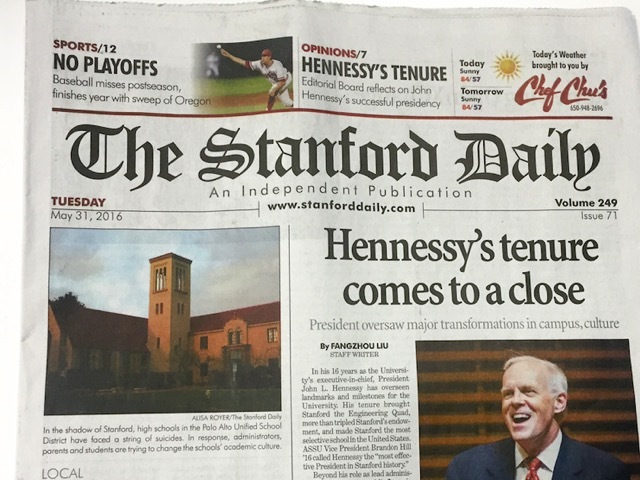 John Hennessy, one of Silicon Valley’s most connected and successful businessmen, has ended his 16 years as President of Stanford University and nearly 40 years on the faculty. He greatly expanded endowments and the university’s engineering school, which has spawned companies such as Google and Yahoo. Marc Andreessen, the developer of one of the first web browsers and a top Silicon Valley investor has called Hennessy “Godfather of Silicon Valley.” He sits on the boards of Google, Cisco Systems, and Atheros Communications. As President of Stanford University he has raised massive amounts of money, $1.6 billion in 2015 alone, allowing for the expansion of Stanford’s engineering school with a brand new quad, and many other buildings. His engineering credentials and high profile in Silicon Valley’s tech community have critics saying that Stanford is now seen as a tech-oriented school and it’s humanities schools have suffered. The explosive demand for computer science (CS) Engineers helped fuel a big expansion of the computer science school at Stanford but it won’t be enough to supply all the engineers needed by many industries. We’re going to struggle to meet the [CS] demand. All institutions are facing this because CS graduates have lots of good opportunities, both within the academy as well as outside it. We're also going to see other fields begin to change, but change takes a long time. Universities change at a very slow pace getting new faculty. …We're going to see a rise of the influence of big data in the social sciences, and they're going to become more quantitative in how we formulate policy.